Spearman is a city in Hansford County, Texas, United States. As of the 2010 census, the city population was 3,368. It is the county seat of Hansford County, and is known for its collection of windmills from the J.B. Buchanan windmill collection. 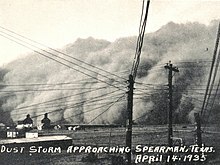 Dust storm approaching Spearman in 1935 during the Dust Bowl. Spearman was platted in May 1917 in anticipation of construction of the North Texas and Santa Fe Railway. A post office opened in 1917, and by that time E. C. Hays had a store near the site. The city was named for Thomas E. Spearman, a vice president of the North Texas and Santa Fe Railway. World War I delayed completion of the railroad from Shattuck, Oklahoma, until October 1919, but Spearman was already thriving; several churches and businesses had moved in from Hansford. Spearman remained the terminus of the railroad until 1931, when the line was extended to Morse and points south. The town was incorporated in 1921 and had thirty businesses, a brick school building, and a population of 1,000 by 1926. In the November 2011 election, Spearman residents voted to allow the sale of alcoholic beverages within the city limits, making Spearman a "wet" city in an otherwise "dry" county. The law took effect December 15, 2011 and allows the sale of beer and wine in retail establishments such as grocery stores and all liquor sales in a licensed liquor store. Additionally, all alcoholic beverages may now be sold in restaurants who apply for and receive a liquor license. Spearman is located at 36°11′40″N 101°11′39″W﻿ / ﻿36.19444°N 101.19417°W﻿ / 36.19444; -101.19417 (36.194450, −101.194048). According to the United States Census Bureau, the city has a total area of 2.1 square miles (5.4 km2), all of it land. According to the Köppen Climate Classification system, Spearman has a semi-arid climate, abbreviated "BSk" on climate maps. As of the census of 2010, there were 3,368 people, 1,137 households, and 817 families residing in the city. The population increased approximately 11% from the 2000 Census count of 3,021. The population density was 1,445.0 people per square mile (558.1/km²). There were 1,278 housing units at an average density of 611.3 per square mile (236.1/km²). The racial makeup of the city was 49.2% White, 0.4% African American, 0.1% Native American, 0.4% Asian, and 1% from two or more races. Hispanic or Latino of any race were 48.9% of the population. These numbers represent significant demographic changes in Spearman over the past decade. There were 1,137 households out of which 36.0% had children under the age of 18 living with them, 61.8% were married couples living together, 6.9% had a female householder with no husband present, and 28.1% were non-families. 26.1% of all households were made up of individuals and 14.0% had someone living alone who was 65 years of age or older. The average household size was 2.58 and the average family size was 3.14. In the city, the population was spread out with 28.8% under the age of 18, 6.8% from 18 to 24, 25.8% from 25 to 44, 21.9% from 45 to 64, and 16.7% who were 65 years of age or older. The median age was 37 years. For every 100 females, there were 91.7 males. For every 100 females age 18 and over, there were 89.6 males. As of 2009, the median income for a household in the city was $48,021, and the median income for a family was $52,085. The median per capita income for the city was $17,314. About 12.5% of families and 18.0% of the population were below the poverty line, including 24.6% of those under age 18 and 18.6% of those age 65 or over. The City of Spearman is served by the Spearman Independent School District. Schools in Spearman ISD, include Gus Birdwell Elementary School, Spearman Junior High School and Spearman High School. Mickey Gates, Republican member of the Arkansas House of Representatives from Hot Springs, Arkansas; reared in Spearman prior to the age of fourteen. Rex Linn, the actor best known for his role as Frank Tripp on CSI: Miami, lived in the area and attended school in Spearman. Joe Redington, founder of the Iditarod, lived in Spearman for a brief time. ^ "Texas State Historical Association – Home". TSHA Online. Retrieved 2012-01-19. This page was last edited on 26 November 2018, at 23:26 (UTC).